Martin Figura and Helen Ivory, two of Norwich’s foremost contemporary poets have been married for over twelve years. The multi-award-winning couple who are an inspiration to anyone interested in the written word, will read from their various poetry collections along with some new work. Martin Figura’s work ranges from the laugh out loud to the moving and dark territory of his Ted Hughes Award short-listed collection and show, Whistle. He’s toured pubs with his Boring The Arse Off Young People show in 2017 and been performing his new acclaimed spoken word show Dr Zeeman’s Catastrophe Machine at various literary festivals. He managed to perform at Kent and Sussex Poetry Society, Bristol Poetry Festival and Camden Comedy Club within a week of each other. He is also a widely published and exhibited photographer and draws on photography in his writing. Helen Ivory is a visual artist as well as a poet and her two most recent publications reflect that: a beautiful box of Tarot Cards Fools World, with leading artist Tom de Freston won the 2016 Saboteur Award for Best Collaboration, and a book of her own collage poems Hear What the Moon Told Me. Her fifth collection of poems The Anatomical Venus, is scheduled for publication in early 2019. It draws on folklore, and medical and cultural history to explore the theme of women and otherness. She teaches on the UEA/WCN online creative writing programme and edits Ink Sweat & Tears. Martin and Helen are very different writers, who write together in the same room and are each other’s first readers. They are also both visual artists and this is important to both of their writing practices. They’ll be open to questions on this and other aspects of what it’s like, sharing a writing room with another poet. It promises to be an interesting afternoon with poems and cake! Donations appreciated; booking essential; tea, cakes, wine, beer available to purchase from The Old Poppyland Tea Room. Martin Figura’s collection and show Whistle was shortlisted for the Ted Hughes Award and won the 2013 Saboteur Award for Best Spoken Word Show. He won the Poetry Society’s 2010 Hamish Canham Prize. His most recent publications are Shed (Gatehouse Press) and Dr Zeeman’s Catastrophe Machine (Cinnamon Press) both published in 2016. The spoken word show Dr Zeeman’s Catastrophe Machine, showcased in 2016, begins touring in 2017. He was recently runner up in the 2017 RSPB/Rialto Poetry Competition. He lives in Norwich with Helen Ivory and sciatica, where he runs the literature event Café Writers. Helen Ivory is a poet and visual artist. She has won a Gregory Award and her fourth Bloodaxe Books collection, the semi-autobiographical Waiting for Bluebeard was shortlisted for the East Anglian Book Awards (2014). She edits the webzine Ink Sweat and Tears and is tutor and Course Director for the UEA/Writers Centre Norwich online creative writing programme. Fool’s World a collaborative Tarot with the artist Tom de Freston (Gatehouse Press) won the 2016 Saboteur Award for Best Collaborative Work. Hear What the Moon Told Me, a book of collage/ mixed media/ acrylic painted poems, was published this year by Knives Forks and Spoons Press. She was recently awarded an Arts Council grant to work The Anatomical Venus, her forthcoming collection from Bloodaxe Books. 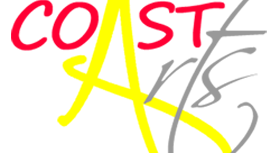 Coast Arts was born from the Cromer and Sheringham Arts and Literary festival which has run 7 successful autumn festivals with events across many artistic disciplines including: painting, sculpture, dance, theatre, literature, film, poetry, music, photography, installations, workshops & many other diverse events. The object of Coast Arts is to promote and provide access to the arts in the Cromer and Sheringham areas, celebrating the variety and quality of work produced in the local area and creating a vision to share for the common good – giving local communities and visitors the opportunity to experience local, regional and national creativity.